Harry’s Pizzeria, Now Open at 11:30 a.m. for Lunch! Our pizzeria down the Design District block is turning back the clock early this fall, with new opening hours of 11:30 a.m. Monday through Saturday! More time with Harry’s for lunch, more love to share, like its new salad – a delicious combination of free range chicken, bulgar wheat, greens, dried apricot, red onion, celery, almonds and mosto vinaigrette! Make a meal of it. Here’s what else is cooking to enjoy 30 minutes more of each day. While we eagerly await the arrival of Michael’s Genuine Home Brew 12 ounce bottles, Harry’s is pumping out the pumpkin brews, all rotating just in time for fall! Right now UFO Harpoon Pumpkin is up in the bottle, to be followed by Post Road Pumpkin, Southern Tier Pumpking, and if you’re lucky according to manager and beer handler Margot Eisbart — Dogfish Punkin. Due South Honey Wheat is coming on tap soon, too, a close-to-home favorite which we love. Drink Like a Local! Don’t worry, we got plenty of Lake Meadow Naturals farm eggs to go around, but Harry’s Sunday Brunch features a weekly-changing section of six new dishes from chef de cuisine Manny Sulbaran and sous chef Steven Martin that are anything but inside the pizza box. Dishes yesterday included Roasted Nectarines with brioche & whipped ricotta, Short Rib Arancini with arrabiata sauce, soft scrambled egg, and piave, Pesce Fritto Misto with Michael’s Genuine Home Brew vinegar, Roasted Vegetable Crespelle with tomato & pesto, Mushroom and Caramelized Onion Frittata, and Nutella and Cherry panini with coconut. Best part is, Christine Susu posts pictures on its Instagram at the start of service every Sunday so you never go without a heads up of what’s special! Breakfast Pizzas change weekly, too, written on the specials chalkboard, for those of us who love a little egg schmear on the pie. Don’t know who doesn’t! Bring your friends and family and please join us on Sundays from 11:00 a.m. until 4:00 p.m. Also, Sunday is when we celebrate our favorite five customer Instagrams of the week and post them on Harry’s website. Dig in and snap away! Harry’s Chef Pop-Up Series is in the homestretch of its second year of monthly family-style dinners. Two more to go in 2013, and finishing strong! October welcomes visiting guest chef Benjamin Ford! Known not only for his creative techniques, but also for his innate understanding of the ingredients in his dishes, Ben opened Ford’s Filling Station in Culver City, California in 2006, serving seasonal food for the people of the community. Designed to be casual, open and familiar, the room is full of artifacts from Chef Ben’s life, his books are on the shelves, and his music plays on the stereo. It’s a soulful space, a place of substance to come and revive the senses and refuel the mind, body and spirit. The “Filling Station” metaphor and slogan “Fuel No Gas” are representative of a place to come to fill up on all the good things in life. Click here for tickets and menu. Wood Oven Roasted 1/2 Chicken with salsa verde & fennel slaw (Monday,) Spezzatino, an Italian beef stew served with orzo salad (Tuesday,) Slow Roasted Leg of Lamb with mint pesto, farro salad & flatbread (a new favorite on Wednesdays,) Wood Oven Roasted Pork Ribs with balsamic BBQ, roasted corn & slaw and Wood Oven Roasted Local Fish with vegetable stew (Friday.) Yum. Last but certainly not least, we love Michael’s new sign for Harry’s, fabricated by our sign guy Paul, who also did beautiful work at The Cypress Room. Check out the video of its installation on Harry’s Instagram. 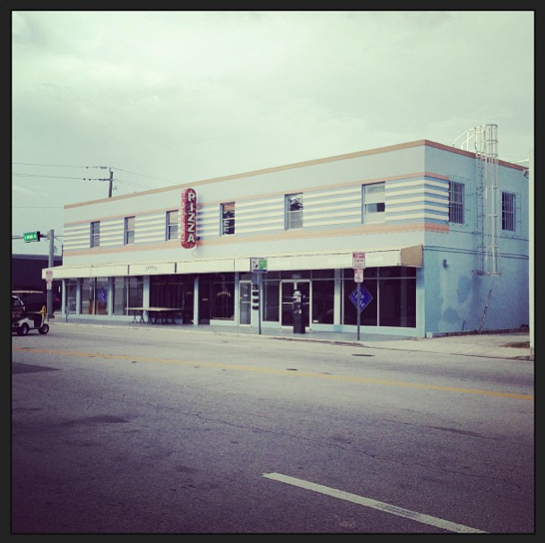 Now no one traveling down North Miami Avenue will miss a Harry’s opportunity with our shiny new beacon of pizza hope. Great work Chef!